Pouteria. (From the indigenous name.) Sapotaceae. Fifty species of evergreen, woody shrubs and trees, to at least 30m. Leave alternate, usually oblong-lanceolate, entire, on short petioles. Inflorescence an axillary cluster or solitary; sepals 4-11, imbricate (4-6), spirally arranged (6-11) or in pairs (4); corolla cyathiform to tubular, tube shorter than or equal to lobes, green or white to yellow, lobes usually erect, 4-6(-9); stamens 4-6(-9), alternate with staminodes, usually included, partially fused to corolla, staminodes equal in number to corolla lobes, ovary superior. Fruit a berry, usually fleshy; seeds one to several, broadly ellipsoid, with a long scar. Pantropical. Z10. Pouteria sapota, widely grown in the lowland tropics in Central America for its large, carbohydrate-rich fruit, and Pouteria campechiana, with smaller, sweeter fruit of mealy texture, are handsome and productive ornamentals in tropical and warm subtropical gardens. On perfectly drained soils in maritime areas, they show good wind resistence, but will tolerate a range of soil types (pH 5-7), including sandy and clay soils (provided subsoil drainage is good). 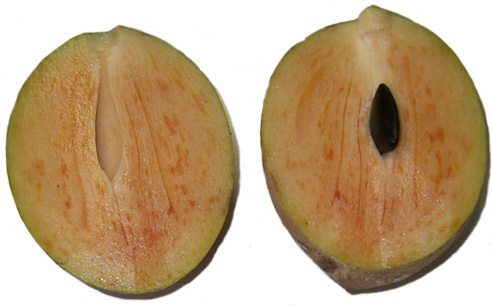 Both species are susceptible to waterlogging and will defoliate if subjected to even short periods of drought; when mature, Pouteria campechiana will survive short-lived light frost. They are sometimes grown in cool temperate areas in collections of economic plants, with treatment as for Chrysophyllum, although they are unlikely to fruit in any but the largest glasshouse. Propagate by seed removed from their husk before sowing, or by side-grafting on to seedling understocks. Air-layering may also be possible. CANISTEL; EGGFRUIT; SAPOTE; BORRACHIO/AMARILLO. Tree to 17m, usually shorter, especially in cultivation. Leaves in spirals, 7.9-25(-33) x 10cm, on 1.2-2.5(-4.5)cm petioles, narrowly elliptic to oblanceolate, apex acute to rounded, glabrous, vein pairs 9-18, chartaceous. Inflorescence a 2-3-flowered axillary fascicle, flowers green-white, probably unisexual; sepals 0.45-1.1cm, 5(6), broadly ovate to suborbicular, with short hairs outside; corolla 0.75-1.35cm, cylindrical, lobes 5-7, rounded or truncate, stamens and staminodes 5-7. 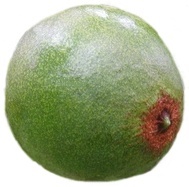 Fruit 2.5-7cm, ellipsoid to subglobose, yellow to green or brown with a smooth, membranaceous skin, pulp mealy, orange or yellow, sweet, edible; seeds 1-6, 2-3.8cm, ellipsoid or crescent-shaped. Mexico to Panama. SAPOTE; MAMMEE SAPOTE; MARMALADE PLUM. Tree to at least 30m. Leaves (10-)18-35(-60)cm, on 1.3-4.7cm petioles, spirally arranged, oblanceolate, chartaceous, glabrous above, sparsely pubescent on midrib or glabrous beneath, vein pairs 20-25. Flowers 1.2cm diameter, in 3-6-flowered fascicles; sepals 8-10mm, with adpressed hairs outside, outer 1.5-2mm, inner 5-6mm; corolla broadly tubular, 0.7-1cm, lobes 5, 2.5-4mm, broadly oblong or spathulate, stamens and staminodes 5. Fruit 9-12cm, broadly ovoid to ellipsoid, skin roughened, brown to grey-brown, pulp bright orange, buttery, very sweet; seeds 1, 6-7cm, ellipsoid, glossy dark brown. Mexico to Nicaragua. Most cultivars have medium-sized fruit (0.5-1kg) for example ‘Mayapan’, ‘Pantin’, ‘Tazumal’; ‘Magana’ has fruit to 2.5kg.